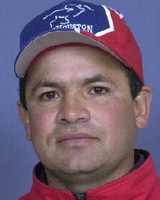 The Texas horse racing community lost a valued member on Tuesday, February 25, when trainer Ramon Flores died in an automobile accident. Flores and one of his grooms, Rafael Hernandez, were hauling three horses to Sunland Park when they lost control of the van on an icy patch of road near Schulenberg, Texas. Flores died instantly. Hernandez and the horses were in good condition. "Ramon Flores was a fine trainer and an up and coming talent," said Robert L. Bork, president and general manager at Sam Houston Race Park. "We are devastated by his untimely death and express our sympathy to his wife, Amy and his two young children. This is a very sad loss for the entire racing community." Flores, 34, was fifth in the trainer standings at Sam Houston Race Park with a record of 104 starts, 16 wins, 12 seconds and 12 thirds. His horses have earned $182,396 through February 23. Flores had won the $75,000 Martanza Handicap on Texas Champions Day with Manzottina for Cuadra Valedor of Mexico City. Respected by his fellow horsemen, Flores was regarded as an excellent horseman with a very "hands on" approach to training. Many riders in the Sam Houston Race Park jockey colony rode for Flores, but he was extremely close to John Jacinto. Jacinto, last year’s leading rider, credits Flores for much of his success. "The very first winner (Lexiesride on December 22, 2000) at Sam Houston was for Ramon," recalled a shaken Jacinto. "He was very close to me, like a father. I felt confident with Ramon because he knew each of his horses so well and was a really good trainer. When I won he congratulated me, but even when I did something wrong, he never got mad. He treated each of his horses with respect and patience. It didn’t matter if it was a stakes horse or a claimer, he was very good to each horse." "Ramon was probably the most honest trainer that I have ever known," said Israel Florez, owner of Kentucky Bay, the first stakes winner Ramon trained. "He was a very hard worker and was kind to all of his horses." Flores is survived by his wife, Amy, son Fernando, 8 and daughter, Brisenia, who just turned one. Donations may be sent to the Ramon Flores Fund in care of the Racetrack Chaplaincy of Texas, 7575 Sam Houston Parkway West, Houston, Texas, 77064.